The King Abdullah Financial District (KAFD) is reckoned one of the Kingdom's most ambitious and distinguished projects, and a substantial addition to the economic sector and the urban development in Riyadh. Peikko has delivered bolt connections, lifting systems and fastening items to this prestigious project. Construction of this huge complex is underway, by leaps and bounds, on a parcel (1.6 million square meters area) owned by the Public Pension Agency (PPA), along King Fahad Road, north of Riyadh. It is beset by three main highways: King Fahad Road, the Northern Ring Road, and al-Thumamah Road. The project is made up of two separate parts on either side of al-Thumamah Road. The two parts are connected to each other through a bridge taking the form of a spacious garden through the highway. 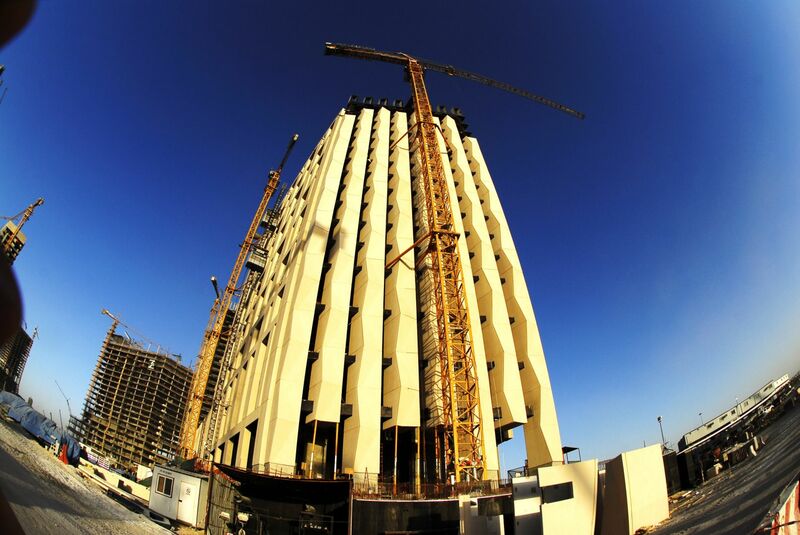 This district is projected to be among Riyadh's most outstanding landmarks. It ranks the first across the Middle East in terms of its size, order, and technical specifications; what makes it comparable to the analogous world class financial hubs. The PPA's ambitious approach, as well as its ignited desire towards enhancing the domestic economy in a manner that accords with the national developmental trends, reinforce the strategy it adopts when selecting high-revenue projects, those that can bring about a momentous qualitative developmental leap. This financial district provides a good example; it has been designed according to the world's latest standards, and the highest constructional specifications. And above all, it stands out as an added value to the national economy and the developmental momentum the Kingdom currently undergoes in all walks of life. KAFD is envisaged to be a pioneering financial hub at the level of the Kingdom of Saudi Arabia, as well as the entire Middle East Region, so as to compete many of the world's most prestigious analogous centers. It will contain the headquarters of the Saudi Capital Market Authority, to be accommodated at the tower located in the heart of the district. This tower, with its 385 meters height, is deemed to be one of the highest towers in the region. It will also contain the headquarters of the Financial Market (Tadawul), in addition to a financial academy, and the premises of numerous banks, companies and other financial institutions, alongside financial services companies and other multinational corporations; all of which will effectively contribute to the diversification of the Saudi economy, ranked as one of the region's largest economies. In addition, the district will include a number of towers and buildings designated for highly equipped administrative offices, along with residential buildings. These buildings make up about 21% of the project's buildings. That is to be added to a number of five-star hotels, managed by international corporations specialized in hotel services. KAFD contains a number of elegantly designed promotional places, meant to serve as recreational and educational gathering places for the inhabitants and visitors of the district. Such places include Al-Wadi Park, the Aquarium, the Conference Center, the Built Environment Museum, the Earth's Climate Center, the Science Museum, the Relaxation Health Club, and the Interactive Children's Museum, in addition to the other educational and recreational facilities. Seven mosques, with eye-catching engineering and aesthetic designs, are spread across KAFD. One of these mosques has won the International Prize for Excellence in Islamic Architecture, in terms of both the building and architecture. This in itself stands out as a testimony to the high standards adopted in handling the district as a whole. And this by no means is the only testimony; many other buildings boast their beautiful designs, and high architectural standards. As far as transportation is concerned, modern transportation methods have been adopted for movement among all such buildings and promotional places. The first and foremost of such means of transportation is the monorail Skytrain, which connects the neighbourhoods of the district to each other. There are also inter-building walkways, linking buildings with one another at the first storey, without need to get out of such buildings. It is also allowed, easy and safe to wander and go hiking in whatever part of the district, amidst the beautiful surroundings full of walkways, gardens, roses and trees. Besides, KAFD provides a large number of car parks below each building, in addition to giant park premises, in which high standards are adopted, so that the car driver leaves his car at the threshold of the park, and the special service will do the job until bringing it out again when needed. Saudi Oger Ltd. / Saudi Binladen Group / El Seif Engineering & Contracting Co. / Saudi Construction Co.
Zuhair Fayez & Associates / Dar al-Riyadh Engineering & Architecture / Architectural Studies House Co.